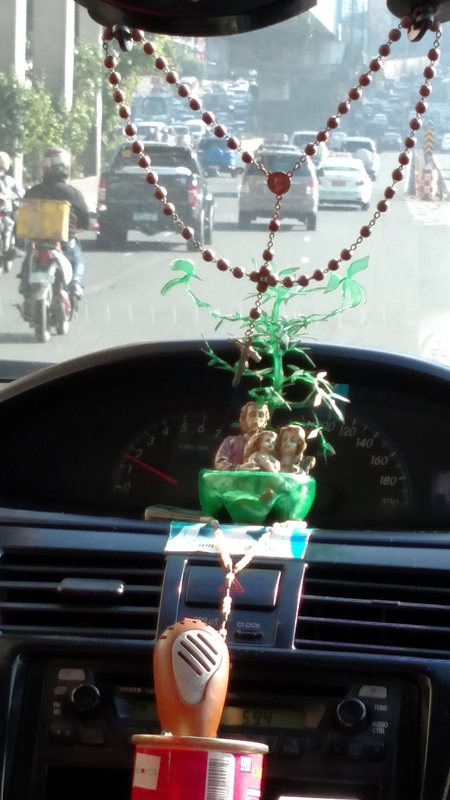 Agile Dispatches from the Field: Traffic and plastic and jeepneys... oh my! 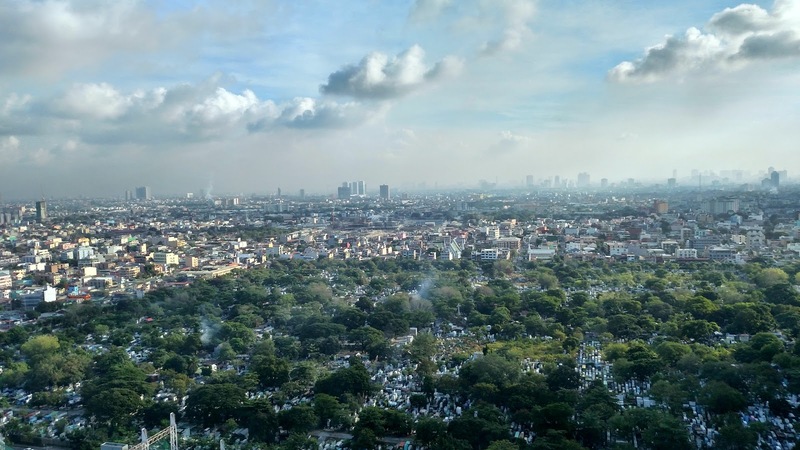 As a new resident of metro Manila, I want to learn how to get around so I can get used to the area and become familiar with the streets and directions. Acceptance Criteria: Pay attention when riding in taxis and ask questions; look at maps to orient myself. The last couple of weeks have been very busy. Not only have I gotten full swing into the work I'm here to do---Agile transition for a large portion of an enterprise--but I found a place to live long-term, started my visa application process, learned how to travel back and forth from the hotel to work while carrying my laptop bag, purse, and grocery bags (because the best grocery shopping is close to work, not the hotel), the best time to get a taxi and where, how to flag a taxi and when to use the GrabTaxi app, and to always have the correct change for the taxi. I am looking forward to living and working in the same area which will alleviate much of the bag-lady/sherpa look I have been cultivating. But the twice daily taxi ride has given me the opportunity to see so many things it's sometimes hard to remember it all and so much has been happening that I will definitely forget it all without some reminders. Good thing I'm blogging huh? 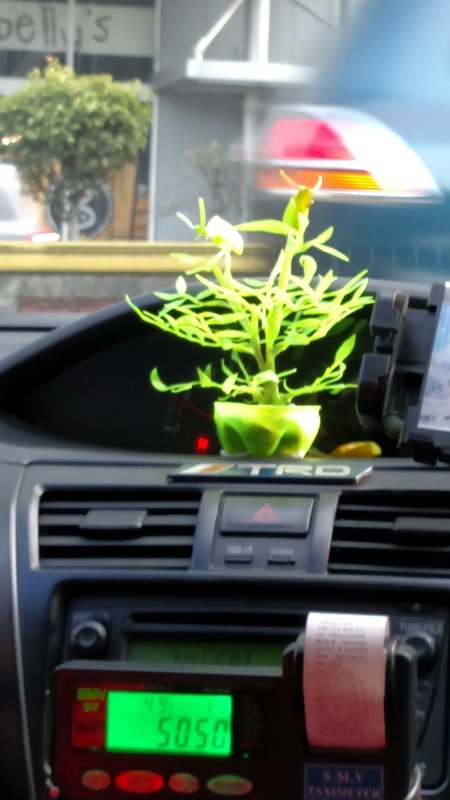 Many taxi drivers here decorate their dashboards. 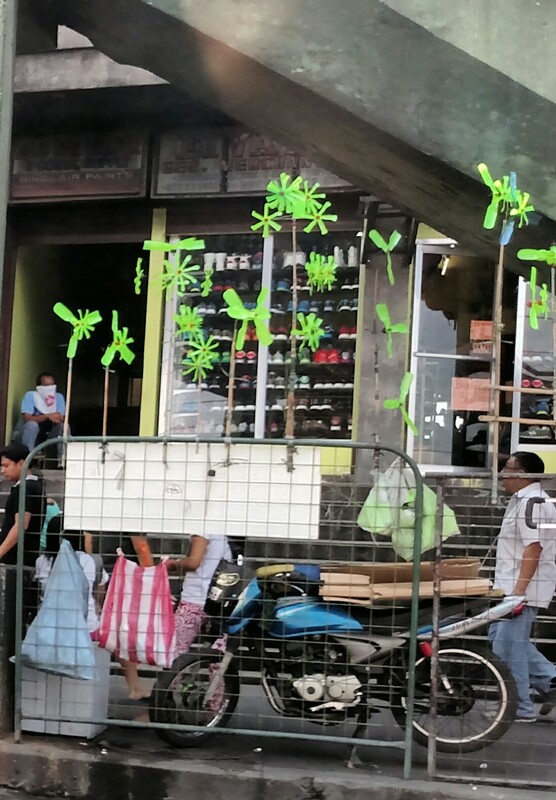 Some with religious icons and artifacts, others with what appears to be a local recycling effort--cutting green plastic soda bottles into small trees decorated with flowers and other items or birds and bugs--and some with both. 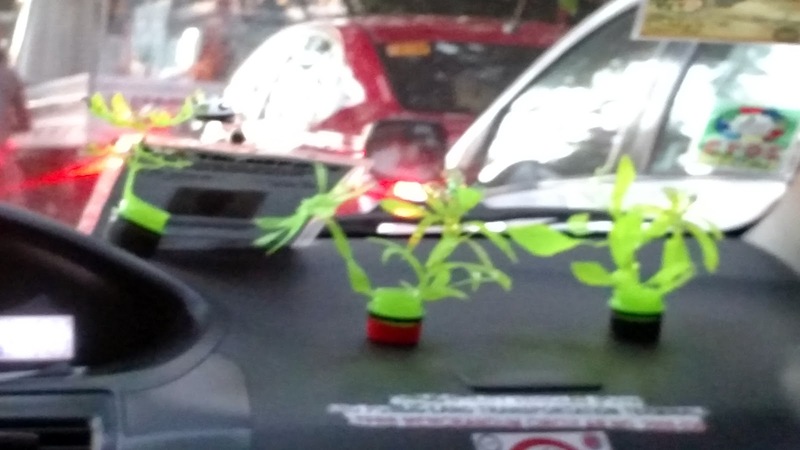 I'm not sure how it got started or who thought of it, but like cutting paper into snowflakes or paper dolls, it appears that someone started cutting the plastic bottles apart and then into shapes, and created these amazing little trees and other things. Most are small and some are medium so my guess is they are made from the 12 and 16 ounce size bottles. You can see the bases in some of them and the lids in others. I have also seen pinwheels and need the time to walk the street vendors and get one of those to see them closer. Maybe those come from larger bottles? I don't know but want to find out. And get my own tree. Although Tagalog is the spoken language of the native Filipinos, English is a very close second. I have no problems at all with language at work and for those who don't have a huge English vocabulary (most taxi drivers or cashiers), they usually have enough that we can get by. Unfortunately, none of them could tell me where they got their trees or where I could find one. 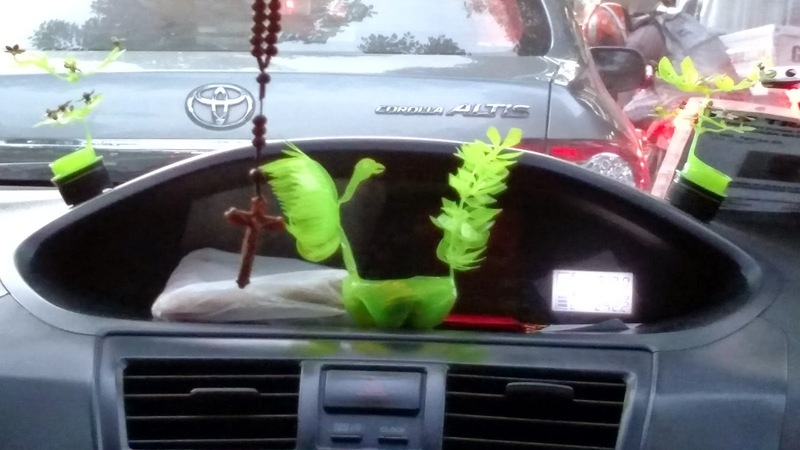 There are many taxi drivers who quietly drive me from place to place; and then there are those gregarious, curious drivers who ask if I'm from Europe or America and then ask all sorts of questions about where I'm from, what do I do, why am I here, do I like it, and tell me to be sure to see Boracay and the underground river; and then tell me I need to make a reservation a month ahead to float the river. One even offered to let me stay in his family's home there. It's interesting, and I wonder if many public transportation providers are similar in their curiosity and generosity but probably won't get to meet others. I have been told not to ride the MRT which is the local train, because there is much theft and people at work have told me stories of losing their wallet, jewelry and more. 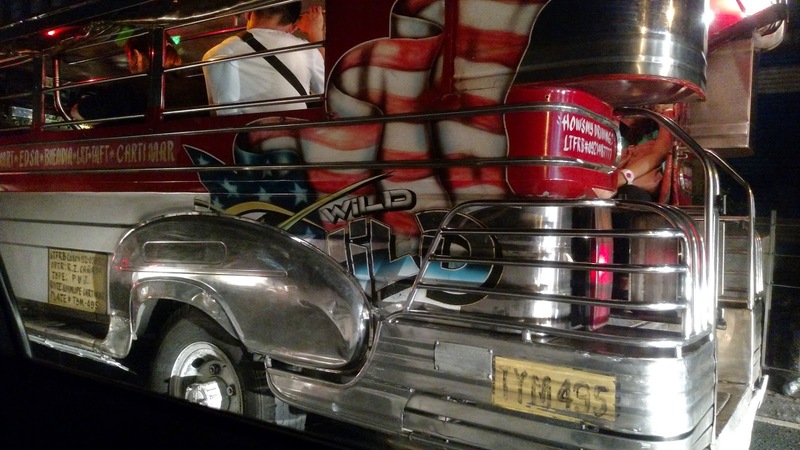 I also haven't tried a jeepney, primarily because I have been told scary stories involving theft about them as well. Which is unfortunate, because I would like to take the train to skip traffic and would like to see what the ride is like in a jeepney. Jeepneys are like small buses. They are all over the place and are very cheap. They were originally US military jeeps left over from WWII; but now they manufacture them for this purpose. I'm not sure how many people actually fit in them but there are two rows of benches inside facing each other and my guess is you can fit about 12 or more people in there. They have jeepney stops like bus stops but people board them wherever they are stopped, even in the middle of traffic. There are buses here too, though they are more long haul rather than within each city. 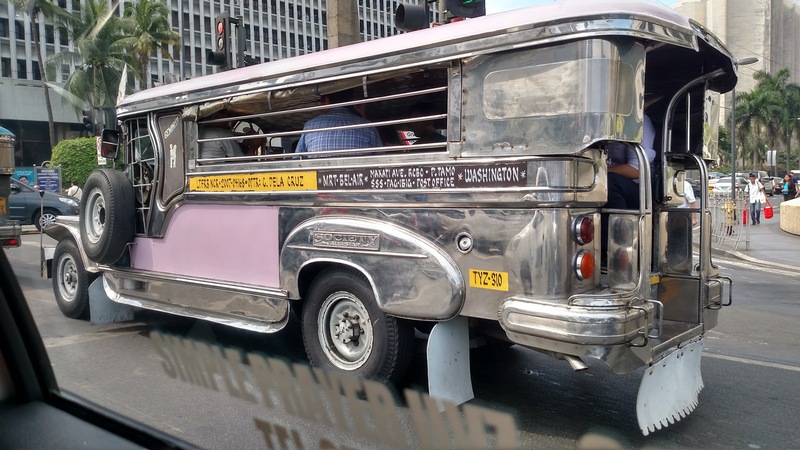 The jeepneys are how you get around in each city; buses get you from city to city. I have also seen them arrive at work and pick up an entire gaggle of people--in this case all young women--and drive off with them. So they must have pre-arranged travel to and from work. Jeepneys are colorful and cheerful and have become a symbol of Filipino art and culture. 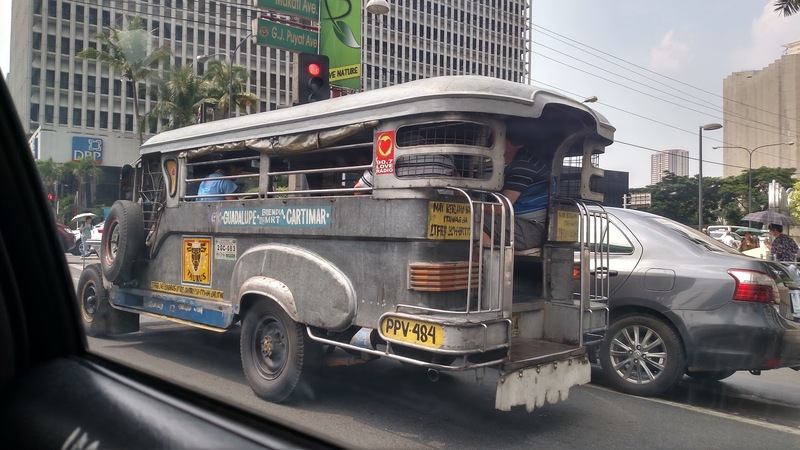 I'm not sure if there is competition or if they make money from it but some of the Jeepneys are brightly painted and have lots of advertisement on the sides. Others are just plain metal but they are bright and shiny, so obviously well tended. The flip side is jeepneys are very loud and belch a lot of smoke, and they are tough customers in the flow of traffic; usually winning the fight for space, especially against a taxi. Of course, there is always foot power and I have made use of that; however walking in 35 degree Celsius weather with about 95% humidity is not something you want to do for hours. So, I get short walks in and make sure there is some air conditioned building to retreat into for awhile before I must brave the sauna again. Which is pretty much what we did in Iowa for the year we lived there; so it's not outside my frame of experience. All in all, I've gotten so good at knowing where I am in the Makati area that I can get around pretty well. I also know how to get back and forth from work so well I've been able to tell new taxi drivers who don't know Makati well. So I've got that going for me. Now I just have to learn about Mandaluyong, since that is where I will be living and working. Until next time kids. Check out this funny video so you have an idea what I hear all day long every day; it's spot on. Mabuhay.